Good morning darlings! For this week's Film Friday I decided to do an Outfit of the Day I haven't done one in so long and I've been posting #OOTD daily on my Instagram (@NskiBeauty) so I figured what better video to do?! Adorable look. That is so my style, except the heals. I'd probably do flats but the heals looks fabulous on you. I love wearing heels with jeans and a plain tshirt!! The necklace was a great touch!! I love the color! I love the necklace, what a great casual look that still have a fashonable flair! The groopdealz necklace really dresses it up. Love the pop of blue against the grey. How cute! 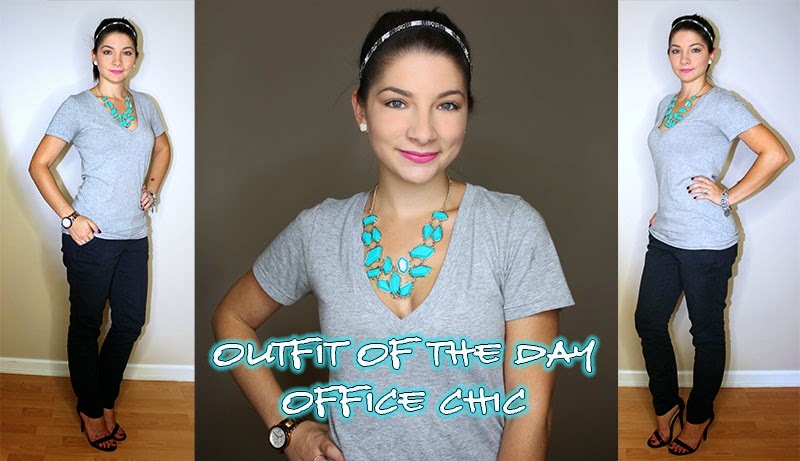 I'm always looking for comfy office outfits since I'm usually just sitting at my desk all day. I love the statement necklace! Love it! I just don't think I could pull off a gray tee at work, but definitely a quick change for a happy hour. You look very comfortable and stylish. I agree with Cristi - I think those heels would do me in! That's super cute. The necklace makes the outfit!